Whole Foods' new Midtown Manhattan store offers self-serve muffins, bagels, bagel sticks and doughnuts. In-store bakeries are vying for coveted breakfast share at a time when morning eating occasions are on the rise. The bakers at Norwalk, Conn.-based Stew Leonard’s begin firing up the ovens at its five stores at 3 a.m. each day to churn out fresh French butter croissants, signature apple cider doughnuts, bagels that are hand-molded, boiled and hearth-baked and other morning delicacies, said Beth Leonard Hollis, EVP and daughter of the store’s founder, Stew Leonard Sr.
Stew Leonard’s clientele, which is mostly foodies who know how to cook, are looking to limit their portions and add positive health attributes this time of year, according to Leonard Hollis. 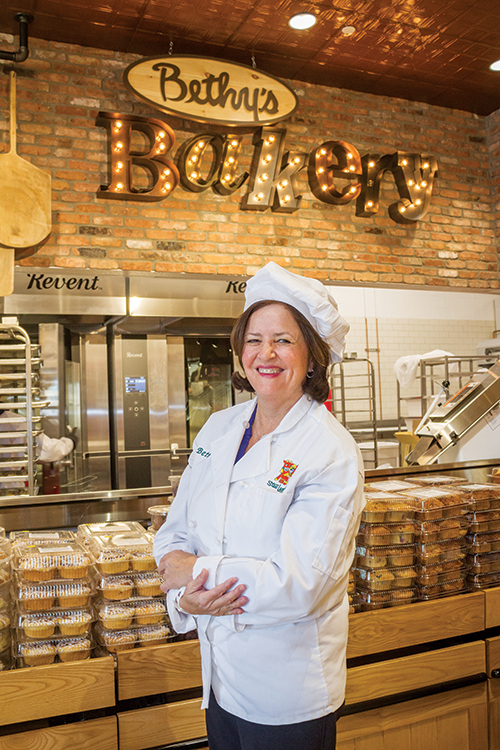 The retailer caters to shopper preferences by keeping its bakers up to speed on the latest baking techniques during seminars taught by skilled instructors. A recent class focused on artisan breads with quinoa and sprouted grains. These breads, along with protein breads, have been a hit with shoppers who enjoy them toasted with avocado in the morning or use them to make sandwiches later in the day. 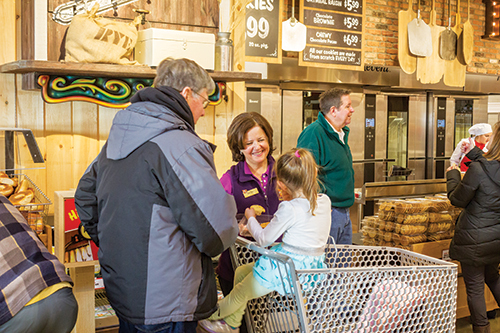 In addition to catering to shopper requests for functional offerings, Stew Leonard’s delights visitors by greeting them with wafting aromas as they enter the open concept store that encourages taste exploration. “As you come into the bakery you smell the fresh bread being baked just as at home, you smell the bagels and doughnuts being fried, fresh popcorn in the bakery and croissants and cookies,” said Leonard Hollis. 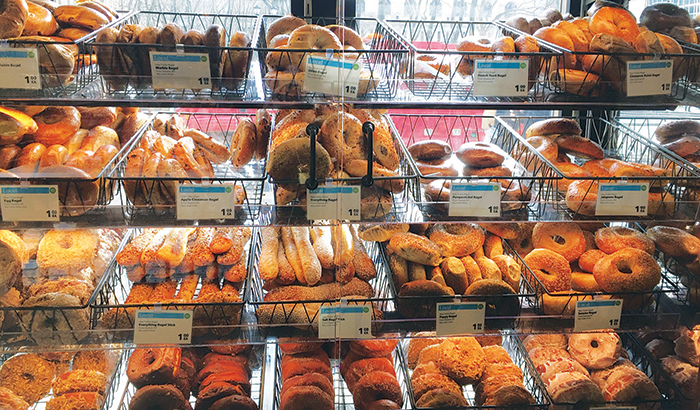 Freshness is among the most powerful tools that in-store bakeries have in their competitive arsenal, said Eric Richard, education coordinator at the International Dairy Deli Bakery Association, Madison, Wis. Some of Stew Leonard's baked goods are sampled on the spot. Breakfast bakery dollars, including sales of bagels, muffins, doughnuts and sweet goods such as cinnamon rolls and coffee cake, were up 2.8% during the 52 weeks ending Dec. 31, 2016, according to Nielsen Fresh. Grocery shoppers are not just purchasing these items to enjoy at home, but for immediate consumption. During 2016, breakfast and morning snacks accounted for 22% of 62 billion foodservice visits (including to grocery stores) during which a prepared food was purchased for immediate consumption. There were 478 million such visits to grocery stores for breakfast meals and morning snacks, and 1.6 billion c-store visits, according to the NPD Group, Port Washington, N.Y.
In-store bakeries can also gain share by positioning coffee stations or juice bars near the bakery, said Richard. “Shoppers are looking for more than just freshly baked product. They’re looking for made-to-order, freshly brewed coffee, other beverages and grab-and-go items. Some are also looking for a seating area to enjoy breakfast,” he said. Consumers also seek a convenient way to quickly complete purchases. This is the reason why drive-thrus and c-stores have been so successful, noted Bonnie Riggs, restaurant industry analyst for NPD Group. Austin, Texas-based Whole Foods Market underscores the convenience of its grab-and-go breakfast offerings by positioning its News Agency coffee and juice bar beside the entrance of its new 43,000-square-foot Bryant Park store in New York City. The News Agency offers many grab-and-go options. The News Agency, which is fashioned after the city’s classic newsstands, features self-serve muffins, bagels, bagel sticks and doughnuts, along with packaged offerings such as cut fruit, yogurt parfaits, knishes and latkes. The space has its own check stands and operates as a standalone shop that opens at 6:30 a.m. — a half-hour before the main store — so that it may cater to busy morning commuters, according to the retailer. Turnip Truck, a natural grocer that operates its two stores in the urban setting of Nashville, Tenn., gets a lot of morning traffic as consumers on their way to work stop in for a quick breakfast bite, Food Service Director Jen Franzen said. “There are quick-service restaurants nearby, but the way we hold our own is with the quality of our product. The fact that our breakfast items are made fresh with wholesome ingredients draws people into the store,” she said. Croissants in plain, chocolate and almond flavors are baked fresh daily in the retailer’s bakeries, as are muffins in blueberry, coffee cake, bran and vegan/gluten-free varieties. Breakfast sandwiches are made on fresh-baked biscuits. A selection of house-made fresh pastries is also available for morning-time consumption, said Franzen. “Our muffins sell the most on the weekday mornings and our croissants sell great on the weekends when people are taking a little more time to eat. We also offer full breakfast on our hot bar on the weekends so we have a lot of customers who dine in on those days,” Franzen said. A fresh juice bar offering 100% organic juice with no fillers and a variety of indoor and outdoor seating options also draws the breakfast crowd. But Franzen attributes much of the return traffic to the retailer’s exceptional service.